One of the more confusing of the macroeconomic debate is the emergence of a profusion of schools of thought with very similar names, but very different viewpoints. The one I’ve had most to deal with is Modern Monetary Theory. I had a go at this topic here and . My brief summary is that MMT pretty much coincides with traditional Keynesian views in the context of a liquidity trap, but that I reject the claim commonly made in popular presentations of MMT, that increased government spending doesn’t imply increased taxation. Then there’s New Monetarism, associated with Stephen Williamson. He and I had a set-to a while back, which entertained many but didn’t produce a lot of enlightenment, and left me disinclined to put a lot of effort into understanding the differences between New and Old Monetarism. (For the record, I’m pretty much an Old Keynesian, but I have learnt a fair bit from New Keynesians like Akerlof and Shiller). The third entrant is “Market Monetarism” associated mainly with Scott Sumner (though Wikipedia tells me the term was coined by Lars Christensen). I was aware in general terms that Sumner advocated a more expansionary monetary policy in response to the current crisis (I agree), that he prefers Nominal GDP level targeting to inflation targeting as the basis for monetary policy (I agree again though I’d prefer targeting levels rather than growth rates) and that he thinks this would be sufficient to fix the problem without any role for fiscal policy (I disagree). However, I wasn’t really aware that these ideas formed the basis of a school of thought, and I still haven’t investigated the underlying theory in any detail. Sumner has commented on my recent posts on fiscal and monetary policy with a couple of his own, so I guess it’s time for me to look more closely at what he is saying. A first response is over the fold. There is a lot in these posts that makes no sense at all to me – I usually find that in cases of this kind there is fault on both sides. Responding to all Sumner’s claims seems likely to produce the worst kind of blogospheric mess, so I’ll focus on what I take to the key point. In his first post, Sumner is mainly concerned to use me as an example of his claim that the economics profession wrongly equates low interest rates with easy money. He starts with a bit of a gotcha, in that the original version of my post looked at a huge reduction in nominal rates of interest (from 17.5 per cent to 5.25 per cent) without adjusting for the small change in inflation expectations that took place at the same time (from about 7 per cent to 4 per cent). As I said in the update, the example works just as well if you look at the reduction in the real rate from 9 per cent to 1 per cent. But this is a side issue, since Sumner says “real interest rates are not much better. At this point, it's difficult to see why Sumner is bothering to pick bones with me. The idea that the stance of monetary policy can be assessed as expansionary, neutral or contractionary depending on whether the interest rate controlled by the central bank is at, above, or below its real long run average neutral value isn't just mine. It's that of nearly all economists, notably including the US Fed. UpdateThe neutral value changes gradually over time in response to a variety of factors, but is sufficiently stable that it can be regarded, for most purposes, as a long-term average, typically assumed to be in the range 1.5 per cent to 3.5 percent. End updateSumner claims that “People get defensive when I make fun of the view that low interest rates mean easy money” but doesn’t name any names. Does anyone really deny that this is the standard view? So far, despite a lot of heat, there is no real disagreement. Sumner says, and I agree that, under normal conditions, most economists assess the stance of monetary policy by looking at the real interest rate controlled by the central bank. This wasn’t always the case. The term “monetarism” is generally associated with Milton Friedman’s view that the central bank can and should target the rate of growth of (some measure of) the money supply. This definition has a lot of problems, though it has the merit that it’s applicable even when nominal interest rates have reached the lower bound of zero. But that doesn’t matter much because Sumner doesn’t like Friedman’s approach any more than I do. If you grant the first of these propositions, the others follow pretty directly. But most economists, including central banks, don’t think it’s true, at least in the context of a liquidity trap. It’s hard to assess the argument without a clear and quantified statement of what monetary policies would be needed to end the current recession. Perhaps Sumner has set this out somewhere, and if so, can link to it. It’s worth pointing out that the Keynesian advocates of fiscal stimulus, notably including Romer and Krugman, have been willing to specify the size of stimulus they think was needed in 2009 and would be needed now. If you don’t accept (1), then the whole argument becomes circular. An expansionary monetary policy, on Sumner’s view, is one that expands the economy. In that case, of course, expansionary policy could never fail, in much the same way as treason never prospers. Going a bit more out on a limb, I don’t think the validity of the liquidity trap argument depends on whether interest rates have reached the zero lower bound. The economy is in a liquidity trap when people want to build up money balances, regardless of the consumption and investment opportunities available to them. If central banks face such a situation, they may give up on interest rate reductions, even before the rate hits zero, if only to avoid making their impotence obvious. Anyway, that’s enough from me. I expect there will be plenty of responses and I hope they may help to illuminate the issues. I once had an extended discussion with Mike Sankowski about this issue. I pointed out that we already have central banks that practice Inflation Targeting (IT), and we already have inflation derivatives markets. Why don’t inflation derivatives suffer from these same problems? In cases where there are inflation protected notes and bonds the treasury is the market maker. In my opinion this is a distinction without a difference. With respect to easily calculated there’s two different issues involved. There’s obviously more data that must be collected to calculate NGDP. But fundamentally this is simply a matter of arithmetic. Calculating inflation on the other hand is a science. I doubt very seriously you’ll be able to convince me that aggregate price indicies are “easier” to calculate given all of the various issues involved. so I suspect that the MR for NGDP is actually smaller than PCEPI over 1997-2009. Yes, but they didn’t until the inflation markets were set up. That was the last time I ever talked to Mike Sankowski. These conversations remind me of my last year in my undergraduate studies when I did an empirical study on the efficiency of monetary policy in a small and open economy. At the time, in the mid-1970s, monetarism was popular and the question of interest was inflation. The test results supported the monetarist hypothesis of the intertemporal relationship between monetary policy, defined as changes in the base money, and inflation, as measured by CPI. A few years later I realised that the test results had become obsolete because the test period belonged to the so-called Keynesian period, characterised by tight regulation of the private sector part of the financial system, relative to what evolved thereafter. The permanent (in terms of my life) knowledge acquisition for me from this empirical study was knowledge of Fourier transformation and cross-spectral analysis. I switched to the axiomatic approach to economic theory (Arrow-Debreu methodology). In this area one can’t simply come up with an idea and find a few numbers in support of it. Both the history of the development of theoretical models, including those of sub-disciplines such as Finance, Development Economics, International Trade, Monetary Economics and the history of the institutional environment become relevant. One of the arguments, presented by one or the other version of monetarists on this blog-site, tries to establish that monetary policy is effective even if the nominal interest rate is close to zero (or zero) – which Keynesians call the liquidity trap. Numbers are presented, all of which I would consider superfluous (including, or rather in particular, arithmetic transformations such as quarterly averages). The reason is that the liquidity trap has not changed but the Fed in the USA has used another policy instrument, currently called ‘quantitative easing’ (QE). Lets have a look at what happens, in terms of the mechanics of implementation, and in terms of effect. a) The daily management of a nominal interest rate target (cash rate in Australia), involves something which is related to QE, but within narrow upper and lower bounds of the cash rate and a very restricted set of securities. We call it open market operations. These operations by the ‘Central Bank’ (eg RBA) intersect with the private financial system. IMHO, this is enough evidence that the separation of ‘monetary policy’ and ‘Finance’ is artificial. b) From a) it follows that, if the private sector financial system differs among ‘countries’, both in terms of regulation and in terms of culture (which may be linked via risk preferences) then it is extraordinarily irrelevant to discuss ‘monetary policy’ of country A, using a mental model belonging to country B. The data is not comparable. This is the reason for my gripe with some criticisms of the ECB. c) From a) it follows that countries which have a functioning payment system (which is part of the responsibility of a ‘Central Bank’), then a nominal interest rate target is quite sufficient and, IMHO, it is a preferred policy target because there is no meaningful measure of ‘inflation’ which would correspond to the Fisher-equation to estimate the ‘real interest rate’, outside the gold standard or if there is only one commodity in ‘the economy’. Furthermore, it is impossible for a Central Bank to target the ‘real interest rate’ when this variable can be calculated only retrospectively. On a related predecessor thread, our host, Prof Q, tried to salvage their argument that it is inflation expectation which matters. The response was: ‘the data was not available’. And another furthermore, the nominal interest rate target is observable by everybody and, those who want to, can observe how the private financial sector reacts to any changes in the target rate, form their own expectations, work out their own ‘real interest rates’ (plural, including the ‘own interest rate’ – real – in their segment of the labour market, in some financial securities and physical assets markets) and make decisions. This is a bit of the famous ‘real world’. It looks very different from macro-models but quite comprehensible from the perspective of these dreaded axiomatic models (which take only preferences and resource constraints as axiomatic in the sense that they are the two fundamental elements of ‘an economy’). I venture to say it is also more comprehensible to people, like Ikonoclast, who say they are neither a mathematician nor an economist (but can read, write, do arithmetic and think). d) The idea of an ‘inflation market’ is another one of those ideas where adding the word ‘market’ is supposed to be something desirable. What actually happens is nothing other than another set of financial securities is created. The idea that these securities can reflect inflation expectations is not convincing for those people who are aware that all prices are interrelated. Traders in these financial securities are motivated in the same way as traders in all other financial securities. e) QE, as carried out in the USA was, in a sense, necessary because the payment system of the USA in the first instance and, thanks to globalisation of the financial system, the rest of the world was at risk of collapse (critical point). Surely, this problem is very different from evaluating the ‘stance of monetary policy’ in the context of a ‘business cycles without critical points’. (Ikon, do you remember my post around the Lehman event, when I said now the proverbial Wall Street bankers and their associates are running to the government which has a bigger balance sheet than their own to exchange their junk securities, denominated in fiat currency units for official currency units?). I believe it was obvious to many people that the GFC was the outcome of agents in the private sector of the financial system being able to issue various types of debt securities with increasingly impenetrable complexities, all of which were denominated in fiat currency units. Hence, their bankruptcy would affect the payment system and the US had to defend its currency. Mark Sadowski’s excerpt from the Fed documents confirms the exchange of private sector created debt, denominated in US currency units, for actual US fiat money. All this is not visible from annual balance sheets because the numbers aren’t colour coded. The numbers are prefixed with US$. ii) One re-examines the period which contains critical points and reaches a retrospective conclusion about the past. iii) One chooses data that is available at the time when one looks at it without asking whether the data was available in decision making time. iv) One adopts a policy objective, which appears to be quite consistent with macro-economic policy talk. For example, the terms ‘recession’ and ‘depression’ have been banded around in the press for so long that one can reasonably expect anybody who offers the potential for eliminating recessions and depressions must be on the right track. v) Nominal aggregate income is a good candidate. It does not violate any of the monetarists’ dictums, including the quantity theory of money and the restatement of the quantity theory of money and the Fisher equation. It is a macro-economic variable. It allows a blurring of the distinction between a monetary policy target, which is under the control of the ‘Central Bank’, and activities that are under the control of the private financial sector, which subsequently require QE. In this degenerate sense, the ‘quantity of money’ is under the control of ‘government’. Nominal income level is consistent with a huge number of alternative scenarios faced by people in the real world (as lived rather than calculated). It is useful to consider the limiting scenarios. a) A nominal income level target is consistent with only two individuals out of say 300million to trade with each other and 300million – 2 are starving. b) A nominal income target is consistent with every one of the say 300million people to have equal incomes. Furthermore, a nominal income target is quite consistent with ‘business as usual’ for the private part of the financial system and monetary policy becoming defined as QE if they’ve done it again. PS: Contrary to Mark Sadowski’s assertion in a related predecessor thread that the Fama-Fischer-Jensen Efficient Capital Market Hypothesis is related to Samuelson’s work, the said authors of the hypothesis make it perfectly clear their random walk model has its origin in the work of a French mathematician, Louis Bachelier, who published a his theory of speculation in 1900. As for randomness in prices in a general equilibrium context, see Beth Alan’s work on approximate equilibria.. Your discussion of sectorial flows demonstrates that public sector deficits, by providing cash flow to the private sector, do in fact mitigate the effects of private sector deleveraging. Given that the money supply, outside of the relatively minor currency component, is the liability of the banking sector, private sector deleveraging is by definition deflationary. I other words public sector deficits have mitigated the effects of private sector deleveraging by supporting private sector cash flow and is not evidence of error in the theory that Japan is in a balance sheet recession. In fact, given the lack of inflationary pressure in the Japanese economy, it is contrary to your argument. In the canonical Fisherian theory of interest, there is, at any moment of time, a unique equilibrium rate of interest (actually a unique structure of equilibrium rates for all possible combinations of time periods), increasing thrift tending to reduce rates and increasing productivity of capital tending to raise them. While uniqueness of the interest rate cannot easily be derived outside a one-commodity model, the assumption does not seem all that implausible in the context of the canonical Fisherian model with a given technology and given endowments of present and future resources. In the real world, however, the future is unknown, so the future exists now only in our imagination, which means that, fundamentally, the determination of real interest rates cannot be independent of our expectations of the future. An estimate of inflation expectations is thus useful not only for assessing monetary policy stance in via its interest rate policy but for conducting such policy in real time. The fact that the RBA first adopted a call rate target in January 1990 during a period when no measure of inflation expectations was available, and perhaps consequentially downward adjustments in short term rates were much slower than in the three previous such adjustments and, most importantly, that this was immediately followed by the most serious recession in Australia since the Great Depression seems telling. It also bears some resemblance to US interest rate policy from July 3, 2008 through October 7, 2008 when the fed funds rate remained pegged at 2.00% despite the fact 5-year inflation expectations as measured by TIPS plunged from 2.72% to 0.62%. The fact that the nominal interest rate target was fully observable by everybody and people were completely free to work out their own real interest rates did not shield them from the worst effects of such a policy in the 1990 Australian recession or in the 2008 U.S. financial crisis, did it? In the real world nominal incomes are far more easily observed and comprehended than any measure of interest rates could possibly be. Except that during the 2008 financial crisis the dollar was soaring in value due to surging demand until the Fed stepped in with nearly $600 billion in temporary reciprocal currency arrangements (i.e. central bank liquidity swaps) with foreign central banks to help provide liquidity in U.S. dollars to overseas markets. Private label MBS, CDOs, stocks or corporate bonds were accepted as eligible collateral by the Fed’s emergency credit and liquidity programs. However the Fed currently only holds about $2 billion of such assets. “Nominal income level is consistent with a huge number of alternative scenarios faced by people in the real world (as lived rather than calculated). It is useful to consider the limiting scenarios. And so is every otherwise totally worthwhile government policy that is not designed to directly designed to address the distribution of income. Again, Japan’s private sector financial surplus is more a story about the government sector’s business cycle driven borrowing needs than of the private sector’s balance sheet repair driven savings needs, so there’s little evidence that it has anything to do with deleveraging. You’re assuming that a lack of inflationary pressure even with low nominal interest rates can only be caused by a so called “balance-sheet recession”. As of August 2008 the BOJ had increased its monetary base by 124.2% from its average level in 1990 (keep in mind this period encompasses Japan’s 2001-06 QE). By comparison, as of August 2008 the Fed increased its monetary base by 200.3% from its average level in 1990, and based on data from the BOE’s Statistical Abstract, in August 2008 the BOE’s monetary base was 276.5% larger than the total liabilities on its balance sheet in 1990. So given how slow monetary base growth has been in Japan it’s not at all surprising that they have no inflation. 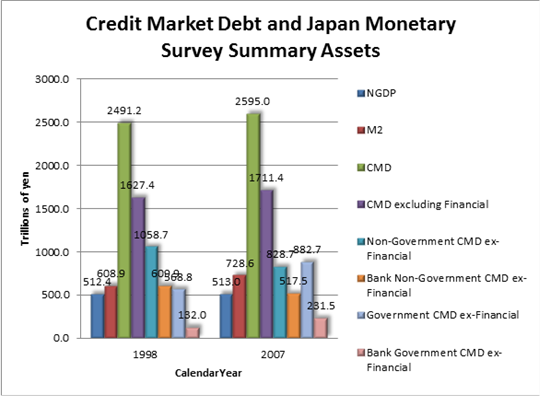 Japan’s depository institutions do have a substantial proportion of the non-government credit market debt excluding financial sector credit market debt with the share rising from 57.6% in 1998 to 62.4% in 2007. And the share of government credit market debt held by depository institutions rose from 23.2% to 26.2%. But the overall share of credit market debt excluding financial sector credit market debt fell from 45.6% to 43.8%. So your implicit claim that money supply growth is constrained by the supply of debt that can be placed on the asset side of depository institution balance sheets seems wanting. What would we discover if we had equivalent data for financial sector credit market debt? Well the newer series shows that claims on financial sector fell from 43.1% of all financial sector credit market debt at the end of 2003 to 30.4% at the end of 2007. So were we able to include financial sector credit market debt over this time period it would likely reduce the share of total credit market debt held by depository institutions and it would result in an even stronger downward trend in the depository institution share of total credit market debt. 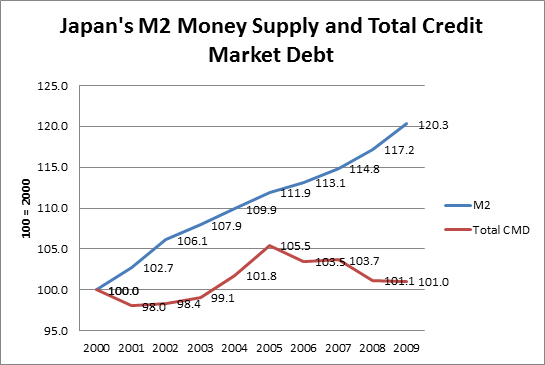 Note that total nominal credit market debt declined in 2001, 2006, 2008 and 2009 and yet M2 grew continuously. With the exception of calendar years 1997 and 2001 fiscal policy was expansionary during 1995-2003. Do we know anything about the fiscal policy stance prior to 1995? An excellent summary of the Japanese discretionary fiscal stimuli programs is Anita Tuladhar and Marcus Bruckner’s “Public Investment as a Fiscal Stimulus: Evidence from Japan’s Regional Spending during the 1990s” (IMF Working Paper No. 10/110, April 2010). Appendix Table 8 lists two fiscal stimuli for 1993 and one each for 1992 and 1994, so fiscal policy was obviously expansionary for the entire 1992-96 period. It also lists nine fiscal stimuli and three tax cuts during 1995-2002, but none during 2003-07. The fiscal tightening in 1997 is explained by the fact that Japan raised its consumption tax from 3% to 5% on April 1, 1997. The fiscal tightening in 2001 seems to have been passive. The expansionary fiscal policy of 2003 represents a carryover of the effects of the 2002 fiscal year, which ended on March 31, 2003. Considering that the BOJ’s call rate wasn’t lowered below 1% until July 1995 and didn’t get below 0.25% until November 1998, Japan’s fiscal policy seems a bit backwards. 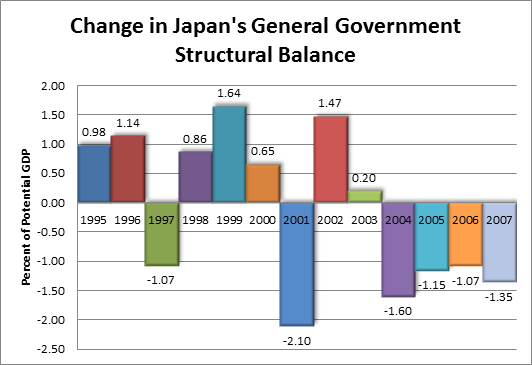 Away from the zero lower bound there’s absolutely no rationale for doing fiscal stimulus unless one wants to see the spectacle of competing policy levers cancel each other out, and yet Japan did eight fiscal stimuli and three tax cuts during 1992-98. On the other hand, if one truly believes in the Keynesian concept of the liquidity trap, then one would want to do fiscal stimuli when the policy rate is pinned to the zero lower bound, and yet Japan practiced five consecutive years of consolidation during fiscal years 2003-07, a time when the policy rate was never as high as 0.5%. 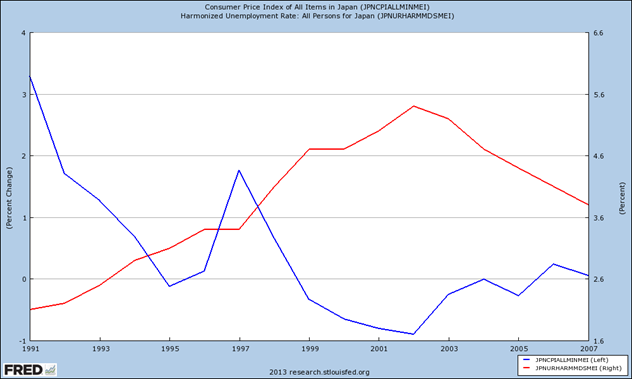 Note that aside from the consumption tax induced increase in 1997 Japan’s inflation rate dropped nearly every year from 1991 through 2002 and then edged upward until there was consecutive years of consumer price inflation in 2006-07 for the first time in nearly a decade. Unemployment increased nearly every year through 2002 and then dropped in 2003 for the first time since 1990, and then continued to drop every year through 2007. And it’s worth noting that even the Nikkei 225 gave its thumbs up during 2003-07, with the index rising from less than 7900 in April 2003 to over 18,000 in June 2007, which is still by far the greatest stock market rally in Japan since the beginning of the Lost Decade(s). And as long as I’m on the subject of Japan’s unemployment rate it needs to be repeated frequently that mindlessly comparing it with other countries is a huge mistake. Japan’s Okun’s Law coefficient or the percentage points that GDP falls for every one point increase in the unemployment rate, has been estimated to be as high as five, or more than double that of the U.S. This is due in part to the fact that the self employment rate in Japan is also high, and that for various reasons institutional employers are more likely to cut back on hours and productivity than let employees go. And finally, Japan’s natural rate of unemployment is unusually low with the OECD’s current estimate of Japan’s Non-Accelerating Inflation Rate of Unemployment (NAIRU) equal to 4.3%. In short, what constitutes a high unemployment rate in Japan is very different than what constitutes a high rate of unemployment most other countries. Yes, there does appear to be a period of decent growth during 1994-97 but considering Japan hadn’t really hit the zero lower bound yet and fiscal policy was expansionary throughout 1992-97 except for the last three quarters of 1997, it would be surprising if there wasn’t. What’s more interesting is the even longer period of above average growth during 2003-07 when the BOJ’s call rate was below 0.25% except for the last eleven months of 2007, and fiscal policy was contractionary for all but the first quarter of 2003. But when you recall that this latter period overlaps comfortably with the period of Japan’s QE things seem far less mysterious. It seems one can’t find evidence of the liquidity trap no matter how hard you try. “…Koo writes about the gradual rebuilding of private balance sheets, preparing the ground for recovery; and Japan did in fact have a fairly convincing bounce-back from 2003 to 2007. 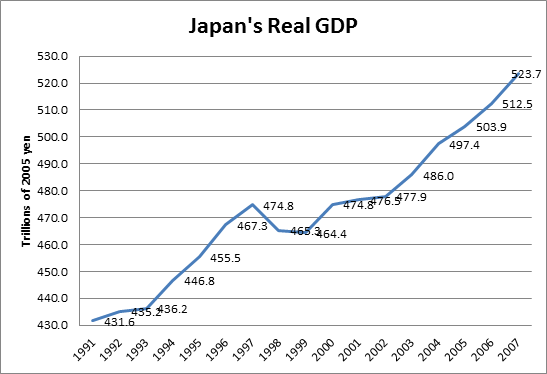 The chart above is a quick-and-dirty summary of the sources of Japanese growth from 2003 to 2007. It shows the change in real GDP, the change in real consumer spending, the change in real business investment, and the change in real net exports, all as percentages of 2003 GDP. What we see is nothing special happening to consumption, which grew more or less at its long-term trend growth rate, and only a modest investment boom. Exports were the driving force behind recovery. Japan’s net exports increased from 1.34% of GDP in 2002 to 1.69% of GDP in 2007. Thus net exports added only 0.35% to Japanese GDP during 2003-07, or about 0.07% a year on average. So why are Krugman’s results so different from mine? In nominal terms both exports and imports soared during 2003-07. But thanks to a sharp increase in the average price of Japanese imports only exports increased dramatically in real terms. This is fine from the standpoint of real growth accounting, but the issue at hand was, and is, aggregate demand, which is measured strictly in nominal terms. To claim that net exports drove Japan’s growth during this period is to claim that the source for the increased aggregate demand came from abroad when in fact it came from the Japanese QE, which succeeded by not only stimulating foreign nominal demand for Japan’s exports through a reduced real effective exchange rate, but also by dramatically increasing Japan’s nominal demand for imports. Knowing how to correctly measure aggregate demand is key to understanding why expansionary monetary policy is a positive sum game rather than a zero sum, or even a negative sum game, as people like Koo claim. Finally, the Japanese quick and severe withdrawal of QE must in retrospect be regarded as an enormous failure. The BOJ reduced the monetary base by 24.4% from January to November 2006 and economic weakness followed within months. 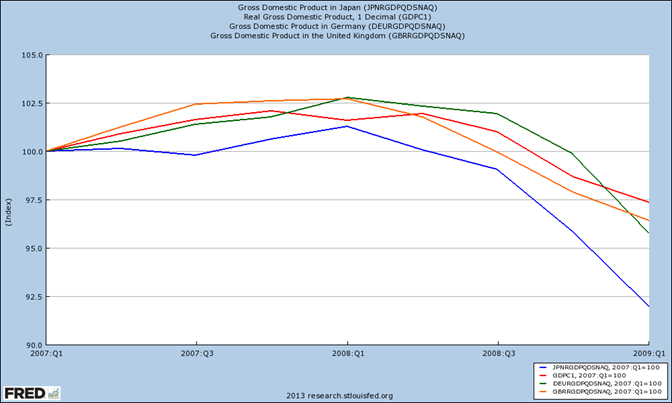 Japan was one of the first major economies to have negative RGDP growth when it fell in 2007Q3. RGDP fell 4.7% at an annual rate in 2008Q2, and 4.0% at an annual rate in 2008Q3, causing Japan to suffer serious consecutive quarterly declines in RGDP before the U.S. did the same. 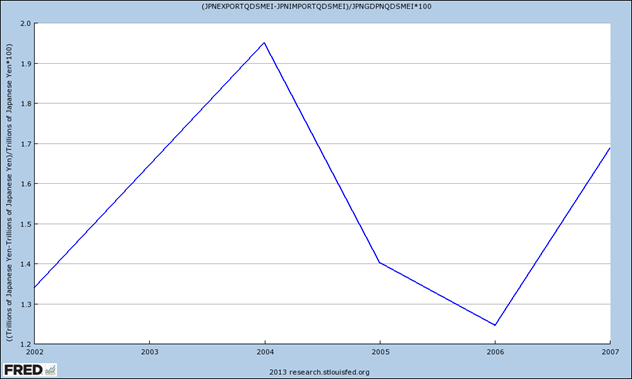 RGDP proceeded to fall 12.4% at an annual rate in 2008Q4 and 15.1% at an annual rate in 2009Q1. All told RGDP fell 9.2% from peak to trough. In short Japanese RGDP fell sooner, faster and further than every other major country this recession. It’s hard not to connect the dots between this result and the BOJ’s sudden and sharp withdrawal of QE, given one literally followed upon the other within months. But Paul Samuelson’s paper is not relevant in relation to the methodological problem with empirical tests, which I raised in relation to your methods, and which I tried to illustrate with reference to the Fama-Fisher-Jensen test of their EMH. Paul Samuelson’s paper is not relevant in this regard because it contains a theoretical analysis. I don’t know whether Paul Samuelson knew about Louis Bachelier’s 1900 thesis in French. I know Fama wrote that he does know. It seems to me, rightly or wrongly, you are an expert in mixing things up for apparently no other reason than wanting to give the impression that you have an answer. It is getting a little tiresome, if I may say. Anyway, you now agree that QE is due to an emergency situation with origin in the international web of proverbial Wall Street bankers and their ‘innovative’ securities and does not prove the invalidity of the liquidity trap. Indeed, you provide evidence that the crisis in the private part of the financial sector was so severe that there was a system switch, at least temporarily, where the international private financial sector transactions were replaced with cooperation between central banks. It may have been lucky that the Fed kept ‘the interest rate’ at 2% for the time period you specified (which I take as given). Imagine they had lowered it and the Lehman event would have happened a few days before Christmas rather than on 15 September 2008. I don’t agree with your proposal that a monetary objective which, as you agree, totally ignores its effect on the wealth distribution, is useful. I would say those who say they belong to the “99%” know that too and they don’t like what they see. Otherwise your reply does not relate to what I had written. You agree that the US government was forced to defend its currency in 2008 by buying junk securities in exchange for fiat money. What? The Fed is still holding US$2billion worth of junk – about 5 years after the event! And you propose business as usual (ie let them lose and when they do it again just do more QE to keep the nominal aggregate income level). You finally acknowledge that the ‘Fisherian theory’ holds for an economy with 1 commodity. Sorry to say, the proponents of monetarism, in whichever form, are still stuck with the 19th century technology of theorising, the ‘Fisherian theory’ as you call it. What if Irving Fisher would disagree with you if he would be alive now? Surely a mathematical economist, like Irving Fisher, would be interested in Roy Radner’s mid-1970s work on Sequence Economies and the problems created by securities markets for getting ‘an equilibrium’ (not to mention a unique one). Why aren’t you? I wrote a long response with links a day ago and it is still in monderation. I never made such an assertion. Period. On the contrary. QE has effects that are the same as if a central bank reduces the policy rate. In particular, real interest rates decline, inflation expectations rise and the currency depreciates. These are the classic financial market effects one might observe when the central bank eases monetary policy away from the zero lower bound. Thus QE is basically expansionary monetary policy, no different in its effects from reducing the policy interest rate, which increases domestic demand, and if done to a sufficient extent will reduce the unemployment rate. Or the financial crisis might have been totally averted, as it was in the many other countries that instead chose to ease monetary policy during this time perod. It’s not clear to me why this would be necessary. Most, if not all, of the financial wealth that was lost in the U.S. due to the GFC has been recovered. A policy of nominal income targeting very likely would avoid, or at the very least ameliorate, the incidence of financial crises. The vast majority of the wealth that is held by the very wealthy is financial wealth. I doubt that it would be totally useless to the nonwealthy. “I would say those who say they belong to the “99%” know that too and they don’t like what they see. I was referring to the “99%”, or rather the “90%”, and in particular that portion of the 90% which don’t pay any attention to macroeconomic issues, which is to say the vast majority of people. No. As the exchange rate of the dollar soared during the financial crisis its value was never in doubt. If anything the dollar was, and continues to be, too expensive. Most of the Fed’s credit and liquidity programs came to an end in July 2010. What I proprose addresses monetary policy issues only. A nominal income target would reduce the probability of the Fed needing to engage in such programs. While uniqueness of the interest rate cannot easily be derived outside a one-commodity model, the assumption does not seem all that implausible in the context of the canonical Fisherian model with a given technology and given endowments of present and future resources. Perhaps oddly to you, I don’t think that he would. I’m more interested in Roy Radner’s work suggesting monetary policy has an effect when introduced when markets are incomplete. No, I did not make up something in your name or wrongly assert you mixed up theoretical with empirical matters. If Monetarists are not interested in theoretical progress since 1950, as seems to be the case, then this is fine with me. One does not have to listen to monetarists. Logically speaking, a model that does not contain a monetary authority is not very likely to have any implications for monetary policy, is it? I do not agree with you because:. 1. What constitutes ‘money’ is by now means a question to which there is a unique answer. (This is supported by history). 2. Monetary authorities are legal constructs, invented by people. The rules (constitution) of the authorities differ. 3. The rules which govern the behaviour of a monetary authority (institutional environment) are not separable from the type of ‘money’ or rather ‘monies’. 4. It may be counter-intuitive from a daily life perspective, but from a theoretical point of view, it is not logical to exclude the possibility that there are many possible institutional frameworks (and this is supported by history). 5. On the contrary, a restriction to the institutional environment at a particular period in a particular place is neither interesting nor ‘logical’ from a theoreticians point of view because it would result in models where it is difficult to distinguish between theoretical knowledge and dogma. 5. In the Arrow-Debreu model, the institutional environment is a complete market for commodities. In the Radner model, the institutional environment is a sequence of commodity markets and securities (privately issued contracts to transfer wealth in a state contingent environment in a multi-period but finite economy. All agents are assumed to be ‘competitive’ (price taking). Insight: If there is no limit on negative quantities of privately issued securities then it is of course possible that under (at the time) unexplored conditions, the system is ‘explosive’ or ‘does not work at all’ (complete market failure). I am not quite sure how to describe the problem of non-existence of a solution in words and at the same time indicating what one can expect in an actual economy where over time more and more different types of privately issued securities are introduced, all of which can influence quantities and prices, without the aid of rather technical language. The insight I take from Radner’s and subsequent work is that it is impossible for a monetary authority to prevent financial crisis in an environment where private agents (eg the proverbial Wall Street bankers) can issue various types of debt securities with increasing complexity, denominated in fiat currency units. The behaviour of the ‘monetary authority’ becomes compliant (ie exchange fiat money for the junk debt securities to prevent a collapse of the payment system with consequences that are unknowable in detail). This is what we have observed with QE in the US. To come up with a ‘real interest’ rate, however approximated, as the clue to the puzzle just doesn’t cut it. By contrast, in Australia where the payment system was not immediately threatened (the regulation of the private financial sector is also different from that of the USA), the then Head of Secretary, Dr Ken Henry, advised the then Rudd Government to literally give a little bit of fiat money to every person who had lodged a tax return and had income less than or equal to a specified amount. This policy was adopted by the government. IMHO, this policy is closer to the desirable aspects of a ‘market economy’ and it signals who is in control of the local currency unit such that the term ‘monetary authority’ hasn’t lost its natural meaning. Whether you call this fiscal or monetary policy is, as far as I am concerned, a question of detail of the actual institutional environment. What matters is that the injection of fiat money went to the right people quickly. “Head of Secretary” should read “Head of Treasury” – another example where I make a half-correction resulting in nonsense. Sorry. I may be speaking out of turn, but I think the stance taken by the MMT crowd is that looking at the absolute level of interest rates is a bad indicator. I think they would agree that lowering an interest rate target definitely represents an easing and raising one, a tightening. To say that the absolute level of interest rates is a good indicator is to say that monetary policy was much tighter in the US in the late 1970s than it is now. Given that we had high and rising inflation in the late 1970s and we have stable and below “target” inflation now, does that really make sense? Or is inflation not primarily a monetary phenomenon? It is highway robbery. Legal highway robbery apparently. The idea that looking at a calculated ‘real interest rate’ misses the point by a distance further than the circumference of the earth. There is an urgent need to have quantity restrictions on various types of securities with zero being a possibly optimal number for a lot of these securities. There is also a need for an ‘enterprise agreement’ for lawyers and other rent seekers, signed with the government. I’d like to remind, my academic background is in general equilibrium theory of the neo-classical type. All models I am aware of have a minimum wealth condition, about which little seems to be known among various schools of monetarists.